If you're not an Esty.com shopper yet, then I'm thinking you should be. It's an awesome place to shop for anything from art to clothes to soap and jewelry and of course greeting cards. I'm constantly amazed by the unique and creative items that people sell on the site. Because there are over 200,000 vendors, a "Treasury" is one way to expose a few of those vendors and their work. My cards have been listed in several treasuries, and I have failed to save all of them (they disappear after a few days.) Below is the most recent one in which a Skeese Greets card was listed. 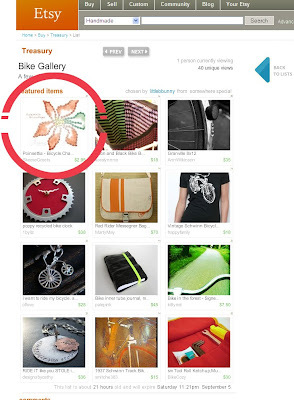 The Treasury is titled, "Bike Gallery: A Few of My Favorites" and consists of bike themed items from 12 Etsy.com shops. The creator of the Treasury chose the Skeese Greets "Poinsettia" bicycle chain Christmas card. When there are millions of items from which to choose, it's pretty cool to be hand selected for Treasuries. I'm flattered and very appreciative each time.